We know from deeds held by South Gloucestershire Council that 13 Castle Street in Thornbury was built by James and Alexander Smith before 1830 and probably after 1819. The deeds held by the owner of what is now number 13 Castle Street contain an indenture dated 5th April 1923 which is a mortgage for £500 between John Hodges as a mortgager and his mother Elizabeth Matthews Hodges and her brother William Mathews Rugman as mortgagees. The mortgage was raised on two properties; one was the Green House (now Clematis Cottage) and the other was what is now number 13 Castle Street. This latter property was described as number 32 on the Tithe Apportionment Map of 1840 and occupied by James Bevan, then James Morgan, then George Fry, Frances Cornock, Sarah Wickham and now Alfred Williams. This list in the mortgage gives us a definite record of the people who occupied the house from before 1839 to 1923. We know that around 1818 – 1820 James Bevan owned various properties in this area of Castle Street, including the Lion House and Dot Cottage. However at the time the property that is now 13 Castle Street became a house it was most likely to have been owned by Betty and Benjamin Smith. James Bevan was described as a “shopkeeper” in the 1791 Trade Directory but we also have evidence that James Bevan and his son James Bevan junior were involved in the public house and carrier trade. It seems possible that James Bevan was using part of this property for stabling. When it was sold to Thomas Gwynn it was said to be occupied by James Morgan. We know nothing of James Morgan and feel this may have been a mistake for William Morgan. The Tithe Apportionment accompanying the map shows that number 32 was owned by Thomas Gwynn and occupied by William Morgan. William Morgan. The 1841 census shows that the house was occupied by William Morgan a school master aged 48 and Sarah Morgan aged 55. In their household they had two children; 10 year old Charlotte Broadup? and Henry Ford aged 18 months. An 1839 trade directory lists William as running a day school for boys and girls in Church Street. This was the old name for Castle Street so it seems likely that he was running the school at his home. We suspect that William Morgan was the one baptised in St Mary’s Church. The Scribe’s Alcove website has two entries for William Virgo or William Virgo Morgan, who was born on 23 October 1792 but not baptised until 19th March 1797. He was the “base child” of Sarah Virgo. William’s wife, Sarah Morgan seems to have died 19th December 1847 aged 62 and she was buried at St Mary’s Church in Thornbury. The 1861 census shows the widower William Morgan aged 68 and born in Thornbury. The census says he was formerly a schoolmaster and was at the time of the census a boarder in the High Street of Elizabeth Prewett a staymaker. William Virgo Morgan was buried on 4th January 1863. His age was given as 70 years. George Fry. In the 1851 census the house was occupied by George Fry who was then aged 27 and a Master Tailor from Tytherington. Elizabeth Fry his wife aged 36 came from Thornbury. Their children were Ursula aged six, Alvan Powell Fry aged four and Susannah aged three, Annie aged three and George aged 11 months. They had a servant Eliza Barrett aged only 11. Sarah Wickham. We know that Mrs Sarah Wickham lived in this house from 1879. The 1881 census shows us that Sarah was born in the Thornbury area and that she was a widow living alone on her private income from dividends. We believe that Sarah was the widow of John Wickham. The 1871 census shows that they had lived at Wapley in Gloucestershire and that John was the farmer of 170 acres at Down’s Farm. The 1851 census shows John Wickham as a widower with three grown up children at home:- Mary 21 years, Emma 18 years and John 15 years. The 1861 census shows that John had then married Sarah, now said to be aged 44, although we would have expected her to be nearer 50. It is possible that John Wickham married Sarah Day in Clifton in 1854. It also seems possible that Sarah Day was born on September 2nd 1811 and was the daughter of Mary and William Day, a yeoman of Kington. The 1891 census shows that she was living alone in this house. We have a newspaper report of the sad death of Sarah Wickham aged 84 in 1894. Austin Bayliss gave evidence at the inquest into her death that he heard cries for help and he went to Sarah’s door but could not get in. He and a young man called Sewell eventually forced their way in through a back window. They found that Sarah had fallen downstairs – only from the third step from the bottom and lay with her legs twisted under her. They obtained “medical aid” but she died a week later. The report goes on to say “a verdict of ‘accidental death’ was returned.” The Rate Books show that the house was owned by Henry Craven St John until 1890. In 1894 the house was empty but owned by “Hodges”. Alfred was the son of Mark Williams and his wife Emma who were married in the Thornbury area in 1866. Alfred was born on 11th November 1867 in the Thornbury area. The 1871 census shows that Mark and Emma were living at 6 Bath Road with three year old Alfred and his brother Edwin aged one. By 1881 Alfred then aged only 13 had already left home and started work. He was living in Gloucester Road in Thornbury near the Anchor public house and was an “indoor farm servant” for Mary Pitcher a widow who farmed 90 acres. He married Ruth Morgan in the December quarter of 1885 in the Monmouthshire area. We believe that Ruth was born in Alveston on 7th December 1869. In the 1891 census the couple were living on Gillingstool Hill in one of the two cottages which were soon to be demolished to make way for the extension of the Council School. Alfred was then aged 23 and a grocer’s warehouseman and Ruth was 21. They already had two children, Frank Henry aged four and Rosa Kate aged two. In 1894 Alfred was shown as living in 75 High Street. The family moved again shortly after and were shown as living in 13 Castle Street in the 1899 rate book. By 1901 census Alfred Williams had moved again into what is now 52 High Street. Alfred then aged 34 was a grocery porter born in Thornbury. His wife Ruth was born in Alveston and she was 33. Frank aged 14 was born in Alveston and was working as a chemist’s porter. The other children; Kate aged 12, Olivia aged seven Charlotte aged four and Reginald aged one were born in Thornbury. They had three boarders Walter Allcock aged 26 a hairdresser, Nelson Andrews aged 22 a broom maker and Robert Stafford a coachman. While they were in the High Street they ran the Refreshment Rooms, which appears in Trade Directories from 1904 to 1914. They were still running the Refreshments Rooms in 1916 when their son, Frank, married. The 1911 census shows Alfred and the family still living there. Alfred had become an insurance agent and Ruth had become a Refreshment House Keeper and their daughter, Lottie, was helping in the business. The census shows that they had had nine children, but one had died. Apart from Lottie, there were four other children living with the: Reginald aged 12, Harold aged 7, Arthur aged 5 and Cyril aged 2 months. The 1918 electoral register shows their address as Castle Street and in 1919 when their son Cyril started the Council Upper School the family’s address was Castle Street. We believe that this indicates that they had returned to 13 Castle Street. The rate book of 1926 confirms that the house they were occupying was once again 13 Castle Street which was owned by Elizabeth Hodges. Their daughter, Lottie died in July 1926 aged 30. The electoral registers show that the couple continued to live in Castle Street. The register that was compiled in 1939 before the outbreak of World War II shows that a widow Annie Lawrence born 16th December 1879 also lived in the property. She may have been a housekeeper. Ruth Williams died on May 21st 1943 aged 73 and was buried in Thornbury Cemetery. The 1946 electoral register shows that Alfred was then continuing to live in Castle Street. The 1954 and 1958 electoral registers show that Alfred was living with his son Cyril and Cyril’s wife, Hilda at 27 St Mary Street. Alfred died on February 19th 1959 aged 91 and was buried with his wife. Charlotte Elizabeth Williams (known as “Lottie”) died on July 11th 1926 aged only 30. She was buried in the grave where her parents were later buried. Frank Henry William‘s birth was registered in the Thornbury area in the September quarter of 1886. In January 1916 Frank married Frances Minnie Screen 2nd daughter of Sydney Screen of Castle Street. Reginald Alfred Williams was born 23rd June 1899. He started the Council Upper School in 1906 at which time the family lived in the High Street. He left school in 1912 with an exemption certificate. The 1926 Trade Directory shows that Reginald Alfred Williams had a cycle repair shop in Castle Street. Harold Williams was born on 8th January 1904 and he started Council Upper School in 1911 which he left in 1918 to go to work. Arthur Edward Williams was born on 3rd February 1906 and he started Council Upper School in 1913. He was killed in action on January 5th 1945. He was serving as Aircraftsman 2nd Class with the RAF Volunteer Reserve. He is remembered at Labuan War Cemetery in Malaysia and on Thornbury War Memorial. William and Alice Pinnell. The 1901 census shows William G Pinnell aged 27 a carriage cleaner for Midland Railway Company and his wife Alice aged 22 both from Thornbury. The FreeBMD website shows that William George Pinnell married Alice Pritchard in the September quarter of 1900 in Thornbury. Alice was born on 3rd May 1878. There were two William Pinnells whose birth is registered in 1874. The special register compiled in 1939 in preparation for the war shows William was born on 20th December 1873. It seems likely that William was the son of George Pinnell an agricultural labourer and his wife Margaret. In 1881 they were living in Crossways. It would seem that they left the house in Castle Street by 1904 as the house was then occupied by Sarah Wetmore. When Reginald Pinnell started Council Upper School in 1913 the register said he was born 27th January 1906 and was the son of William Pinnell. At that time they lived in Easton Hill Lane. In 1918 Marjorie Pinnell started the same school and the record says that she was born 29th November 1909. Another daughter Doris started the school in 1919 and was said to be born on 6th August 1911. We know from the burial records of Thornbury Cemetery that William had worked as a railway carrier. He died aged 73 when living at Crossways. He was buried on 15th April 1947. Hannah Wetmore. The 1911 census shows that the house was occupied by Hannah Wetmore aged 72 a widow from Old Sodbury and her servant Rosa Summers. In the 1901 census Hannah had been living at Bank Cottage with Mary Wetmore. The 1891 census shows Hannah before the death of her husband Thomas Wetmore a farmer at Newton near Thornbury. At time of that census Thomas was aged 49 and was said to have been born at Hill and Hannah was aged 51 and from Sodbury. In 1891 they had a visitor Sarah Higgs aged 62 and a niece Lucy Higgs aged 27. Alfred Williams. By 1918 it seems that Alfred and Ruth Williams had returned to live at 13 Castle Street. See above. Bridget McKearney. Bridget McKearney bought the building that is now 13 Castle Street from John Hodges the carpenter in 1953. 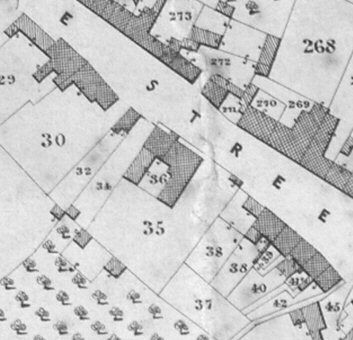 We have also evidence that Miss McKearney later bought the yard next to her property that John Hodges had used as builder’s yard and which also had various outbuildings. The deeds of Clematis Cottage also contain a Conveyance dated 4th April 1923 from Mrs E M Hodges to John Hodges. On this conveyance is an additional note which is a memorandum of a conveyance dated 22nd Nov 1961 made between the National Bank Ltd, as personal representatives of the late John Hodges deceased, and Bridget McKearney transferring the ownership of all that builder’s yard and outbuilding in Castle Street (formerly known as High Street) Thornbury. Miss McKearney also undertook to block up or use opaque glass on the window in the outbuildings that overlooked Clematis Cottage. This had not been necessary originally as both Clematis Cottage and the builder’s yard had been previously owned by the same person. We don’t know of a family connection between John Hodges and Bridget, but it is interesting to note that in addition to the property transactions that went on between the two of them, Bridget also replaced John Hodges as trustees to his father’s estate. We know from the records of what was the Council School and is now Gillingstool School that Miss McKearney was a teacher from Harwich who was appointed to the staff of the school on 1st October 1945. The Harwich connection is interesting. “The History of a School” by Tony Cherry is a history of the school in Thornbury which was known by three names- Gillingstool Primary School, The Leaze School and Thornbury Council School. The book is very detailed and provides many insights into this period in the life of the school. Amongst other things we have learned that on July 1st 1940 twenty two evacuees came to the Council School from The Esplanade School Harwich and these were accompanied by a teacher, Mr Gray and a nurse. They were subsequently joined by others until by July 1941 there were 92 evacuee children and their teachers. We believe that Miss McKearney came with one of the later groups. We do not have a full set of electoral rolls but we do know that the roll of 1946 shows that Miss Brigid (which seems to be an alternative spelling sometimes used in the records) McKearney lived at 17 Eastbury Road, which we believe may have been owned by Thornbury Town Trust. The records show that she remained there for some years. The minutes of the managers of Gillingstool School show that Miss McKearny left to become head at Gotherington School which seems to be near Cheltenham. Miss McKearney did not however leave Thornbury. Also in the deeds of number 13 Castle Street is a copy of another Conveyance dated 22nd of November 1961 by which Bridget McKearney bought the builder’s yard next to number 13 from John Hodges. We do not at this stage have any idea why a spinster lady who is a headmistress would want the builder’s yard and whether she intended it for a building plot or extension to her house. The electoral rolls show that Bridget McKearney continued to live at number 13 until at least 1975. Cyril G and Edwina J Sutch. On the 5th August 1977 Cyril and Edwina Sutch bought both the house and the neighbouring yard from Bridget McKearney. The 1980 electoral roll shows that the house was occupied by Cyril and Edwina Sutch.